Using URL Schemes it is possible to link external applications to Equipd. Have a Bible Reading coming up? Insert the link to your reading in a Calendar Event! Integrate Equipd with Launch Center Pro for your iPhone, and quickly open Today's Daily Text with one click. Format 1 is a very tightly structured url format. In most cases you should use the alternate format outlined in the next section. This format is the most flexible, and perhaps powerful, as it allows for the book name to be written multiple different ways, in full or abbreviated. It also allows for spanned verses instead of the verses having to be specified one at a time. For example "2 Timothy 3:14-16" will look up verses 14,15,16 (this did not work in the old format). scripture - the scripture written out in multiple ways. Check out the examples below which show different formats that are supported for the scripture links - note that there are no spaces in the link anywhere. Another format introduced in Equipd version 2.4.4 allows you to specify the Bible book name (in full), and the chapter, and Equipd will automatically work out the number of verses in the chapter and auto-select all verses. This is handy especially for setting up integration with external 3rd party apps for managing Bible Reading Schedules, such as ReadingPlan. In version 2.4.0 a new feature was added that allows you to generate the URL scheme for a scripture by simply pressing a button. 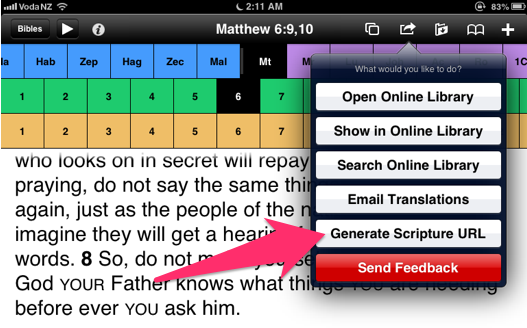 Just look up the scripture, and then hit the action button top/right in the Bible Tab, and press "Generate Scripture URL". This will format the URL for the current scripture you are reading, and insert the link into your clipboard ready to be pasted anywhere you want. You can directly access websites and publications in the Equipd Library using the URL schemes outlined below. In Equipd 3.0 a more powerful URL Scheme was introduced for the Library Publications. LANG = the language code. You can see the language code in Equipd in most language selector screens in blue. PUBABBR = the abbreviation of the publication. You can see the abbreviation in Equipd in blue next to the title of each listed publication. What about if you want to open a specific chapter in a publication? This is now supported as well using the URL of the chapter/article as found on WOL. In fact you can go find a chapter/article on WOL, and copy the address of the page and change the "http://" for "equipd://" and Equipd will do its best to work out the link and open the page for you. Here is a complete list of the Bible Book abbreviations as used by Equipd. You can use the book number or the book abbreviation in the scripture links passed to Equipd when using the "Format 1" url scheme outlined above.